I'd like to think that this book came from The Great Book Exchange in Darlington, but to be honest it was Oxfam in York. They are not worlds apart really, unlike the galactic voyages that take part in this little adventure. One of the main characters in the book has been around for some time, but this is the first full length appearance for them in this trans-temporal adventure. Iris Wildthyme might be familiar to some, as a character from Paul's first book, as well as appearing in the Dr Who escapades but to me, she will always be a special character in fantasy. She's the feisty granny that you would have loved to have been related to. The gin and tonic drinking time traveller with a mysterious past. 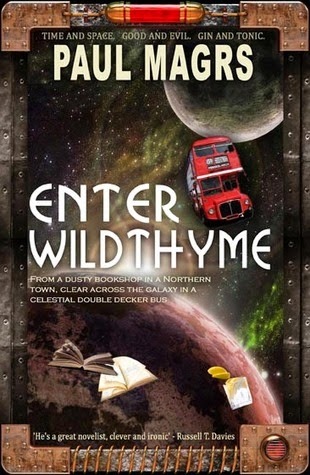 The first part of the book is set in a dusty secondhand bookshop in Darlington. Add in to the mix a celestial red, route master double decker bus and the scene is set for a normal life, but how wrong you would be. Undeniably, Paul has the most amazing world building skills at his finger tips in this book - the story writing is very cleverly executed. Immediately, the reader is thrown into the action with a whole host of crazy and well imagined characters. There is Iris, as well as her sidekick (a stuffed panda) originally known as Panda who is about 10 inches high and cooks a very mean breakfast. As well as a talking vending machine called Barbra, an evil poet called Marvelle and many more crazy folk. I've never had so much fun reading an adult novel before; this was a perfect read for me. It's so crazy and surreal that it was an absolute joy to read. The story is about an object; a glass jar filled with mysterious contents which soon form the focus of a chase. It takes then to the outlandish world of Hyspero, the throne room of the Scarlet Empress and the very brink of the strange pocket dimension called . . . . . The Obverse. This story is an adventure of good and evil - it is a book to read with a very large gin and tonic. It's fast paced; in a blink of an eye the story moves from the mundane life in Darlington to Montmartre in Paris where an alien invasion is witnessed. Never mind being catapulted to the Hammersmith Odeon to a glam rock concert in the 1970's. It really is a breathtaking read; a roller coaster ride of mayhem and madness. Excellent review, I agree completely. Thanks Aaron, for the blog comment. Have a great week!